Winner of Strictly Come Dancing and loving wife to Peter Crouch, Abbey Clancy is one of the most popular English models of recent times. However today it isn’t Abbey who’s getting all of the attention – it’s her mum. Posting onto Instagram earlier today (June 1), Clancy shared a photograph of her now 58-year-old mum, Karen Sullivan, wishing her a very happy birthday, however Instagram users are totally mind-blown. Why? Because her mum looks more 21 than 58. So far the post has received well over 5,000 likes in just a matter of hours – however many of the comments are from gobsmacked members of the public who can’t believe that the woman in the picture is Abbey’s mum and not her sister. Looks like she could be your sister rather than your mum, absolute double of you. You’re the double of your Mam! Beautiful. In case you couldn’t see the likeliness so much on the first image, this second one should do the trick. The resemblance is truly unbelievable. Happy Birthday Karen! Little over a month ago a similar story went viral when Avengers star Chris Hemsworth shared a photo of his mum creating mass hysteria on social media when fans could not fathom his mum wasn’t a ‘girlfriend’. His dad wasn’t left out either, but it’s hardly a surprise – their three sons all have super genes. Posting the photo of him and his parents, Leonie and Craig, from the stands at the Commonwealth Games, Chris’s followers were all too kind in the comments. Wow! Thought your mum was a girl friend, looking so young!! Your father looking good too. Good spirit! Mrs Hemsworth is foxy. Mr Hemsworth looks like a charmer in good shape. Good genes Thor. Chris, who’s married to fellow actor Elsa Pataky, is the middle of three brothers, all of whom are actors – older brother Luke, and younger brother Liam. Elsa was in the news last month after fighting off a metre-long snake in the bathroom of their family home. This is how I put her in the box. So professional! 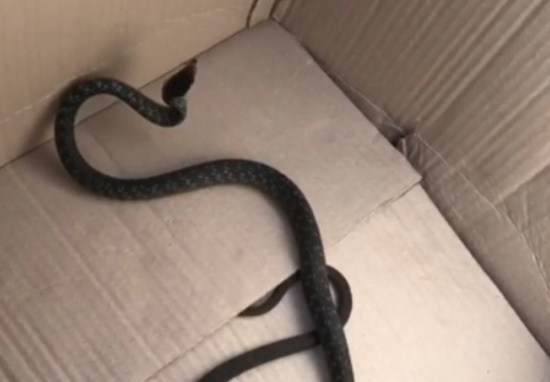 Incredibly, the dangerous serpent ended up in a cardboard box through the use of a pole from a mop and some pretty expert balancing on the lid of the toilet seat.